Blanching corn before freezing it stops the enzymes responsible for aging. Although corn is safe to eat if frozen without blanching, the National Center for Home Food Preservation recommends blanching vegetables to preserve their flavor and color. While blanching in boiling water or steam is recommended, blanching corn in the microwave is a suitable alternative. It is, however, more risky because the food may not be blanched evenly, resulting in a loss of flavor, texture or color during freezing. Husk the corn and snap off any excess cob at the base of the ear. Wipe down the outside of the ear of corn with a soft cloth to remove any remaining silk. Rinse the ear under cold water and pat dry. Cook on high for 7 to 11 minutes, depending on the size of the ears of corn, turning the corn halfway through the cooking time. Water should boil during the blanching process. Fill a large bowl halfway with ice water. Add a tray of ice cubes to the water. Drain the corn and plunge the ears into the bowl of ice water. This cools the corn quickly and stops the cooking process. Keep the corn in ice water until the entire ear, including the cob, feels cool. As a rule, blanched vegetables require the same amount of time to cool as blanching time. Remove the corn and pack in zippered freezer bags, leaving 1/2-inch headspace. Squeeze out the excess air in the bag and freeze immediately. Blanch corn to be used as whole kernel or creamed corn for 4 minutes and cool completely. 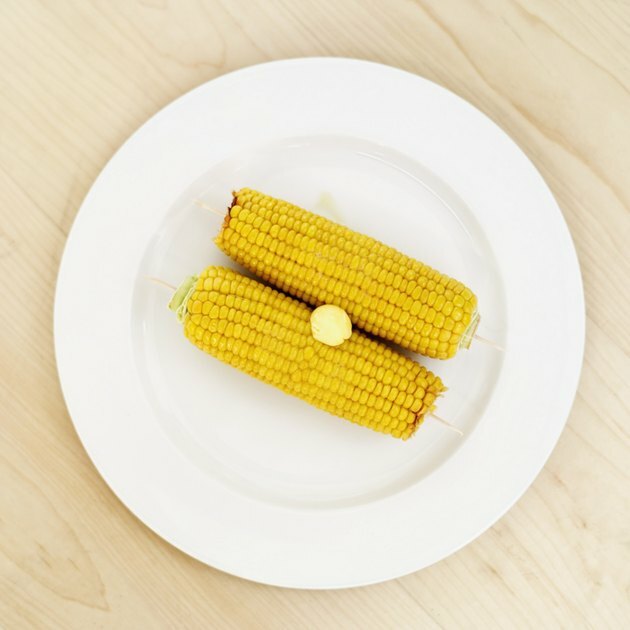 To prepare whole kernel corn, stand the blanched and cooled ear on end its end and slice down the ear, at approximately two-thirds the depth of the kernels. Fill a zippered freezer bag or other freezer container with the kernels and freeze immediately. For creamed corn, cut the entire kernel from the ear with a sharp knife, scraping the milky juice from the cob with the back of the knife. Seal the creamed corn in freezer containers and freeze immediately. Alternately, creamed corn can be made by cutting the kernels from fresh corn and cooking in a double boiler for 10 minutes. Cool the creamed corn by placing the pan in a bowl of cool water. Pack in freezer bags or containers, leaving 1/2-inch headroom and freeze immediately. Use caution when removing corn from the microwave since the escaping steam burns skin quickly.